While it’s clear that baby boomers are on the cusp of aging into senior housing en masse, the lifestyle choices they’ll make and the living options they’ll prefer remain somewhat of a mystery. A new resource could help answer these questions. The “Living Environments” map — made in collaboration with AgingWell Hub and a wide cross-sector of industry and economic players — helps shed light on what boomers might do and experience as they get older over the next five years. Senior housing stakeholders may find it a helpful framework as they plan for attracting and serving the boomer demographic. AgingWell Hub was co-founded with tech giant Philips, and is housed at Georgetown University’s Global Social Enterprise Initiative, which is part of the McDonough School of Business. The map is a representation of its core working team’s collective expertise, experience and research, and also includes data from third-party studies as well as interviews with industry experts. The project also included input from a variety of government and company representatives, such as the U.S. Department of Health and Human Services (HHS), Sam’s Club, Lyft and Deloitte. The map follows a hypothetical person named Melinda as she moves from age 67 to age 72. Melinda is a composite character who represents the majority of older boomers, or “the middle of the bell curve,” as the report puts it. Melinda lives alone in a suburban Atlanta home she’s owned for 35 years, and is recently widowed. She has a net worth of $260,000, which includes about $45,000 in savings, $120,000 for retirement and a credit card debt of $5,000. Melinda leans on her friends from church for support. She is in good health, and is managing her hypertension. Like many other women her age, Melinda doesn’t live near her family but would like to be closer to her daughter and granddaughter, is okay using new technology and has one particularly close friend who lives nearby. By the time Melinda is 72, however, things have changed. In that short time span, her close friend has moved away, she loses her part-time job as an assistant manager at a retail store and she is diagnosed as pre-diabetic. Due to some unforeseen expenses, she spends more money than she had originally planned for, depleting her savings to just over $24,800 and trimming her retirement fund to roughly $82,200. At the same time, her credit card debt has grown to $8,500, and her net worth has shrunk to $215,000 — with the lion’s share of that being home equity. In short, the map aims to use data to predict some of the common motivations behind the decisions baby boomers will soon make, and therefore help industry stakeholders craft housing options, services and marketing pitches for them when the time comes. 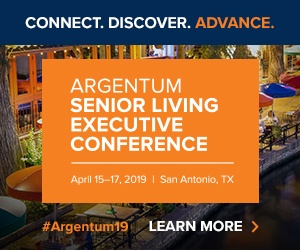 It also shows that even so-called average boomers might have more trouble than expected paying for senior housing and care when they need it most — an important fact as senior living providers grapple with a dire need for more affordability in the industry. At the end of her five-year journey, Melinda must make a choice: does she stay at home? Downsize to a new home and stay in Atlanta? Downsize and move elsewhere? And, farther down the road, will she develop dementia? How will her health care needs change? This map doesn’t answer the previous two questions, but AgingWell Hub is currently planning to release two more subsequent reports on the later stages of Melinda’s life in 2019.